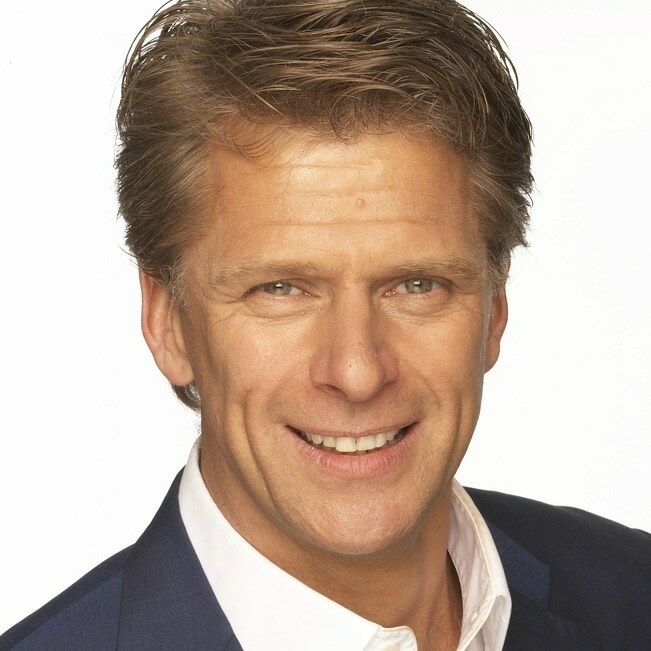 Andrew Castle is one of the most experienced live broadcasters in the UK. Using a vast knowledge of news and current affairs he has interviewed everyone from Tony Blair to the Rolling Stones, Vera Lynn to Beyoncé, Binyamin Netanyahu to Miss Piggy. The GMTV sofa was Andrew’s home for 10 years and in that time his reputation and profile were such that he was invited to take part in some of Britain`s best loved shows. Andrew danced his way through 8 weeks of BBC1`s “Strictly Come Dancing” in 2008, survived the most gruelling month of TV on ITV1`s “71 Degrees North” and has tested himself on “Mastermind” “Beat the Star”, “All Star Family Fortunes”, “Who Wants to be a Millionaire”, “Celebrity Mr and Mrs” and “Masterchef” where his egg and bacon went down a treat. Andrew has presented two big money game shows on ITV, namely Perseverance and Divided, which ran for two years, and is a regular guest presenter on Channel 5’s popular panel show, The Wright Stuff. Live radio experience includes presenting BBC Radio London 94.9 and the LBC 97.3’s weekend breakfast show, discussing the week’s top news stories and engaging with an audience of over one million listeners every Saturday and Sunday. Andrew now presents the breakfast show slot on Smooth Radio every weekday morning. Andrew’s initial TV work was at Sky Sports where he worked alongside Sue Barker on the tennis coverage as both studio guest and commentator. Following this, he was offered the presenting role when Sue went to the BBC and after 3 years of combining this with live coverage of Basketball, Badminton and Nascar amongst others, he was asked to fulfil the post of Golf presenter for both the European Tour and the USPGA Tour. Andrew worked on 3 Ryder Cup broadcasts and was witness to some of the most dramatic moments in that competitions history, including Brookline 1999. When GMTV came knocking, Andrew felt it was right to test himself in an unfamiliar role. Commended for his work covering the station’s coverage of The Iraq War and the Al Qaeda bombings in Madrid – he broke the news that the terrorist organisation were the perpetrators. Andrew was versatile enough to cover both ends of the news spectrum and was on the famous sofa for countless celebrity interviews and revelations. Tennis laid the foundation for Andrew’s media work. Having grown up in a fish and chip shop and then a council house, tennis was not a natural home but he had ability and tremendous parental support. Andrew left Somerset as a 17 year old to attend a small college in Orlando, Florida. Having won the National Junior College Championships, he was offered a scholarship to Wichita State University in Kansas. Having helped his team to the NCAA Championships he graduated with a degree in Marketing and returned home. Within six months Andrew was British No 1 and had made his Davis Cup debut for Great Britain against Australia at Wimbledon. Andrew played professionally for 7 years. In that time he played all the great players of that era including Boris Becker, Stefan Edberg, Mats Wilander, Pat Cash, Ivan Lendl, Pete Sampras and Jim Courier. Andrew played singles, doubles and mixed doubles in each of the Grand Slam Championships and is proud to have reached the Mixed Doubles Final at the 1988 Australian Open with Anne Hobbs – but wishes that he had served better at match point! With ten years as the BBC’s lead tennis commentator, Andrew’s career has seen him work on 10 Wimbledon Men’s Singles Finals alongside John McEnroe, Jimmy Connors, Boris Becker and Tim Henman. The final frequently attracts over 10 million viewers and has had multiple BAFTA nominations. However, his favourite commentating moment has to be when Andy Murray claimed Olympic Gold at London 2012. Andrew supplements his TV/Radio and broadcast work with after dinner speaking and award show hosting where his clients have included Barclays, The Sunday Times and BP, amongst other household names. Renowned on the corporate circuit, Andrew is a hugely entertaining speaker, auctioneer, inspiring & motivational speaker and a professional host / master of ceremonies. Despite his successful media career, Andrew still plays tennis to a high standard and is a regular in the Men’s Senior Championships at Wimbledon playing with John McEnroe and Tim Henman. In addition, he plays in ‘The Statoil Masters’ at The Royal Albert Hall in December and at the Hurlingham Club, pre Wimbledon. As Virgin Active’s tennis ambassador, Andrew frequently plays in their exhibitions, conducts specialised clinics and speaks at the group’s racquet facilities across the UK. Andrew is available as host, after dinner speaker, motivational speaker and auctioneer.